This past July, Tracy McArdle Brady and her family took part in a social experiment that was followed by fans, robot enthusiasts, news outlets and researchers around the world. 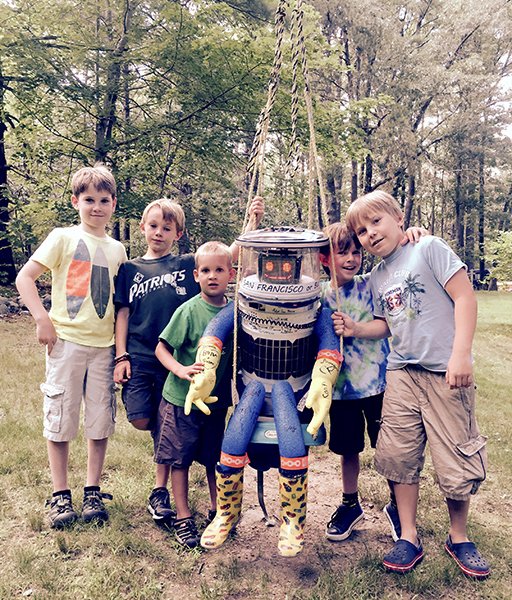 For 24 hours they hosted hitchBOT, a hitchhiking robot from Port Credit, Ontario. As a follow up to its successful trip across Canada and parts of Europe, hitchBOT—unable to move without human assistance—was to travel from Massachusetts to San Francisco. The robot was destroyed in Pennsylvania after two weeks and 300 miles. Created as both an art piece and social experiment by Dr. David Harris Smith of McMaster University and Dr. Frauke Zeller of Ryerson University, hitchBOT was designed to be an approachable robot that would offer a study into human and robotic interactions. While some have asked if humans can trust robots—particularly with the development of self-driving cars—the researchers posed a different question: Can robots trust humans? HitchBOT began its journey on July 17 in Marblehead, its trip chronicled online through its website and Facebook, Twitter and Instagram accounts. Brady first learned of the traveling robot from a co-worker who had acquired it in Gloucester after it returned from a fishing trip. When she told her sons about it and showed them the website, they immediately asked if they could bring it to Carlisle. Brady declined at first, but after learning that her co-worker needed to pass it along—hosts were not supposed to hold on to the robot for more than a day—she surprised her sons with it. “They immediately were interested and intrigued and asking him questions.” Friends of the brothers came to visit the robot, which ended up going for a ride in a backyard swing. At three feet tall and weighing 25 pounds, hitchBOT had a decidedly non-threatening and low-tech appearance. The robot was made from everyday parts: a plastic beer bucket served as its torso, arms and legs were made from pool noodles outfitted with rubber gloves and Wellington boots and its head was made from a cake topper and garbage can lid. Electronically, the robot was a bit more sophisticated. Powered by external solar panels and internal rechargeable batteries, hitchBOT could be charged with an electric outlet or a car cigarette lighter port. The system used an Android tablet running artificial intelligence software and a Wikipedia application that allowed it to have basic conversations, answer questions and search for and recite random facts. A microphone allowed it to capture audio and a camera took photos every 20 minutes that it could post to Twitter. Its location was tracked and posted to its website using GPS and a 3G cellular and Wi-Fi network. LED panels illuminated its “face,” with its only autonomous movement the ability to raise its hitchhiking thumb. The following day, Brady realized that the GPS that allowed the robot’s fans to track it online—which she found was accurate within a block of its location—must have been on a delay to protect people’s privacy. “The day after I dropped him off in Boston people showed up at my neighbor’s house to take him mountain biking,” she laughed. When hitchBOT’s destruction was announced, its social media accounts were flooded with messages of condolence. Roboticists made particular note of the apologies made directly to the robot as a sign of how people had anthropomorphized the machine. The ability of humans to feel empathy for robots is something researchers have been studying for years, particularly in the case of military robots. As the use of robots increases in battle, researchers have recognized unintended consequences as some soldiers develop strong attachments to the robots that protect them, giving them names and assigning gender, awarding them Purple Hearts when injured, holding military funerals for them and in some cases risking their lives to save them. While hitchBOT was destroyed on August 1, Brady only recently told her sons about what had happened because she wanted to make sure she could tell them it was going to be rebuilt. And it is. According to the hitchBOT website, its creators are in the process of determining if the robot will be rebuilt and sent back to Philadelphia in 2016 to continue its journey west, or if they will make hitchBOT available to schools, allowing students to create their own adventures as it is passed from school to school. What a delightful, and somewhat poignant, story! However, it’s encouraging to know that HitchBOT will rise again! !